This salad is spring in a bowl: the thinly-sliced radishes and green onions combine with the salty cheese, toasty almonds and creamy dressing – resulting in a most satisfying and balanced lunch. You could use a vegetable peeler to get nice, thin slices of the ricotta salata or simply crumble it for a more rustic salad. English peas aren’t in season here yet, but I think a handful folded in at the end of this salad would be pretty wonderful, too. Preheat the oven to 350 F. Spread the almonds out onto a small rimmed baking sheet and toast until fragrant and golden, 6-8 minutes. Make the dressing: In the bowl of a food processor (or blender) combine the avocado, olive oil, lemon juice, vinegar, salt and a few grinds of pepper. Process until smooth. Add the yogurt at the end and process until combined. Taste and season with additional salt and pepper if desired. Cook the pasta in a large pot of salted water until al dente. Drain and set aside to cool. While the pasta is cooking, fill a bowl with ice water. Heat a large pot of water over medium-high heat and simmer the asparagus until just crisp-tender, 2 to 3 minutes. Remove asparagus from pot and place in ice bath to stop the cooking. Place cooled asparagus spears on clean surface, towel dry, and slice into 2-inch pieces. 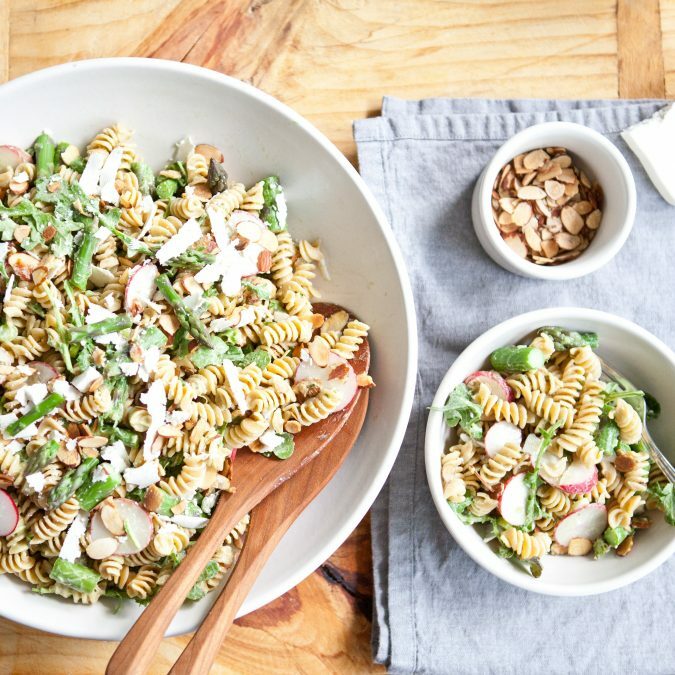 In a large salad bowl, combine the cooked pasta, asparagus and 3/4 cup of the toasted almonds along with the arugula, radishes, green onion, ricotta salata, chives, salt and pepper. Fold in the avocado dressing and toss to combine. Serve at room temperature sprinkling each bowl with a pinch of the remaining toasted almonds. Cover and refrigerate leftovers for up to 2 days.